Offering you a complete choice of products which include desifer 100mg, desifer 400mg, denopsy 14 tablets, denopsy 7 tablets, posanat 300mg and vorizol 200mg inj. Desifer 100 mg Tablet is used in the treatment of iron overload and transfusion dependent thalassemia. Desifer 100 mg Tablet traps and removes excess iron which is then excreted mainly in the stools. This reduces the risk of organ damage. Take this medicine in the dose and duration as advised by your doctor. Swallow it as a whole. Do not chew, crush or break it. 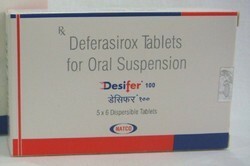 Desifer 100 mg Tablet is to be taken empty stomach. Desifer 400 mg Tablet is used in the treatment of iron overload and transfusion dependent thalassemia. Desifer 400 mg Tablet traps and removes excess iron which is then excreted mainly in the stools. This reduces the risk of organ damage. Take this medicine in the dose and duration as advised by your doctor. Swallow it as a whole. Do not chew, crush or break it. 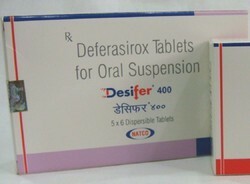 Desifer 400 mg Tablet is to be taken empty stomach. Read the Patient Information Leaflet provided by your pharmacist before you start taking posaconazole and each time you get a refill. If you have any questions, ask your doctor or pharmacist. Take this medication by mouth as directed by your doctor, usually once daily with food. Do not crush or chew delayed-release tablets. Doing so can release all of the drug at once, increasing the risk of side effects. Also, do not split the tablets unless they have a score line and your doctor or pharmacist tells you to do so. Swallow the whole or split tablet without crushing or chewing. 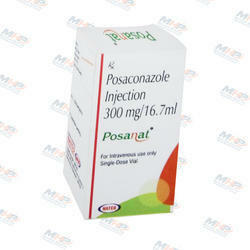 Vorizol 200 mg Injection is used in the treatment of severe fungal infections. 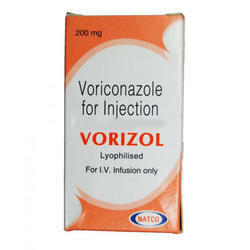 Vorizol 200 mg Injection is an antifungal medication. It kills fungi by destroying the fungal cell membrane. This treats your infection. 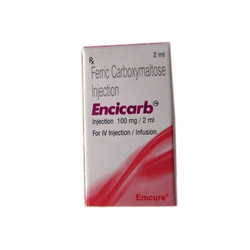 Encicarb Injection is used for Iron deficiencies, Anemia, Anaemia and other conditions. 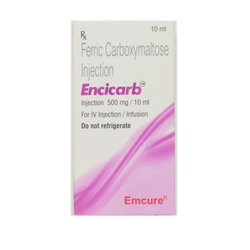 Encicarb Injection contains Ferric Carboxymaltose as an active ingredient. Encicarb Injection works by works as a dietary supplement to fulfill the iron deficiencies and regulate oxygen in the blood. Emcure Pharma manufactures Encicarb Injection. Encicarb Injection is an anti-anemic medication. It replenishes the iron stores in your body. Iron is vital for the formation of new red blood cells and hemoglobin, a substance that gives these cells the ability to transport oxygen. Before using Encicarb Injection, inform your doctor about your current list of medications, over the counter products (e.g. vitamins, herbal supplements, etc. ), allergies, pre-existing diseases, and current health conditions (e.g. pregnancy, upcoming surgery, etc.). Some health conditions may make you more susceptible to the side-effects of the drug. Take as directed by your doctor or follow the direction printed on the product insert. Dosage is based on your condition. Tell your doctor if your condition persists or worsens. 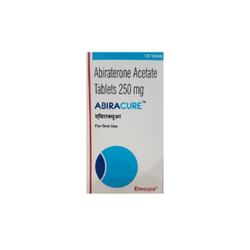 Abiracure 250 mg Tablet is used in the treatment of prostate cancer. Abiracure 250 mg Tablet is an anticancer medication. It works by stopping the body from producing (male hormone), thereby slowing the growth of prostate cancer. Take this medicine in the dose and duration as advised by your doctor. Swallow it as a whole. Do not chew, crush or break it. Abiracure 250 mg Tablet is to be taken empty stomach. 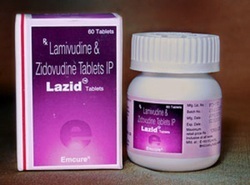 Lazid Tablet is used for Hiv infection, Hepatitis b virus infection, Hiv infections and other conditions. Lazid Tablet contains Lamivudine and Zidovudine as active ingredients. Emcure Pharma manufactures Lazid Tablet. 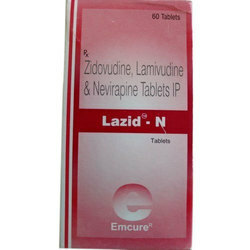 Lazid N Tablet is used for Hiv-1 infection, Hiv infection, Hepatitis b virus infection, Hiv infections and other conditions. Lazid N Tablet contains Lamivudine, Nevirapine and Zidovudine as active ingredients. Emcure Pharma manufactures Lazid N Tablet. Before using Lazid N Tablet, inform your doctor about your current list of medications, over the counter products (e.g. vitamins, herbal supplements, etc. ), allergies, pre-existing diseases, and current health conditions (e.g. pregnancy, upcoming surgery, etc.). Some health conditions may make you more susceptible to the side-effects of the drug. Take as directed by your doctor or follow the direction printed on the product insert. Dosage is based on your condition. Tell your doctor if your condition persists or worsens. Tafero Tablet prohibits the multiplication of HIV and Chronic hepatitis B(HBV) virus in human cells. Thus Prevents the hepatitis B and HIV Virus from Developing new Viruses. 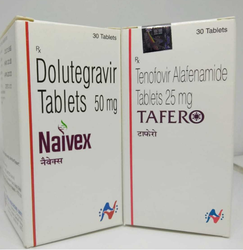 TAFERO, an anti retroviral drug Contains Tenofovir Alafen amide Fumarate (TAF) as a active key ingredient. TAF is a nucleotide reverse transcriptase inhibitor (NRTI) which involves in the treatment of HIV infection and chronic hepatitis B infection. 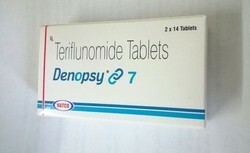 TAF is closy associated with reverse- transcriptase inhibitor Tenofovir disoproxil fumarate (TDF) even if the TAF has good drug safety profile and efficacy, it has some demerits like nephrotoxicity and which reduced bone mineral density. 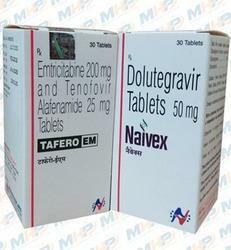 Tafero EM 200mg/25mg Tablet is used in the treatment of HIV infection. Take this medicine in the dose and duration as advised by your doctor. Swallow it as a whole. Do not chew, crush or break it. Tafero EM 200mg/25mg Tablet is to be taken with food. This product is used with other HIV medications to help control HIV infection. It helps to decrease the amount of HIV in your body so your immune system can work better. This lowers your chance of getting HIV complications (such as new infections, cancer) and improves your quality of life. This product is a combination of two different drugs: emtricitabine and tenofoviralafenamide. 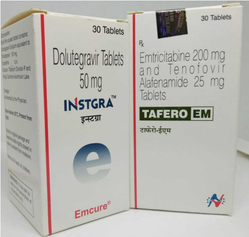 Emtricitabine is called a nucleoside reverse transcriptase inhibitor, while tenofovir alafenamide is called a nucleotide reverse transcriptase inhibitor. They are often called NRTIs. Emtricitabine/tenofovir alafenamide is not a cure for HIV infection. Also, it will not always prevent HIV infection. Tigi 50 mg Injection is used in the treatment of severe bacterial infections. 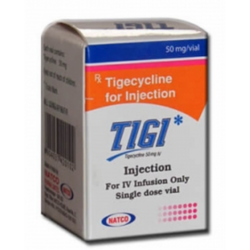 Tigi 50 mg Injection is an antibiotic. It stops bacterial growth by preventing synthesis of essential proteins required by bacteria to carry out vital functions. 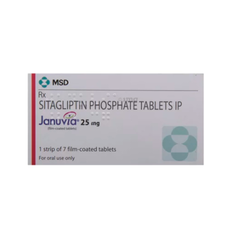 Sitagliptin is used with a proper diet and exercise program and possibly with other medicationsto control high blood sugar. It is used in people with type 2 diabetes. Controlling high blood sugar helps prevent kidney damage, blindness, nerve problems, loss of limbs. Proper control of diabetes may also lessen your risk of a heart attack or stroke. Vorizol Tablet is used for Fungal infection, Fungal infections, Yeast infections, Low white blood cell count and other conditions. Vorizol Tablet may also be used for purposes not listed in this medication guide. 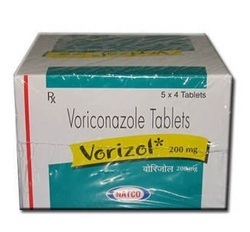 Vorizol Tablet contains Voriconazole as an active ingredient. Vorizol Tablet works by interacting with the fungus and preventing its growth. Natco Pharma manufactures Vorizol Tablet. Before using Vorizol Tablet, inform your doctor about your current list of medications, over the counter products (e.g. vitamins, herbal supplements, etc. ), allergies, pre-existing diseases, and current health conditions (e.g. pregnancy, upcoming surgery, etc.). Some health conditions may make you more susceptible to the side-effects of the drug. Take as directed by your doctor or follow the direction printed on the product insert. Dosage is based on your condition. Tell your doctor if your condition persists or worsens. Important counseling points are listed below. 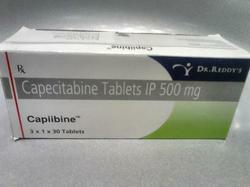 Capiibine Tablet is used for Colorectal cancer, Breast cancer and other conditions. Capiibine Tablet contains Capecitabine as an active ingredient. Capiibine Tablet works by inhibiting the cell division of cancerous cells. Dr Reddys Labs manufactures Capiibine Tablet. Doxotero Injection is used for Acute lymphoblastic leukemia, Acute myeloblastic leukemia, Wilms’ tumor, Neuroblastoma, Soft tissue and bone sarcomas, Breast carcinoma, Ovarian carcinoma, Transitional cell bladder carcinoma, Thyroid carcinoma, Gastric carcinoma and other conditions. 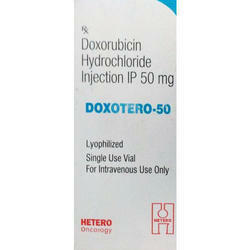 Doxotero Injection contains Doxorubicin as an active ingredient. Doxotero Injection works by stopping the growth of cancer cells. Hetero Drugs manufactures Doxotero Injection. Before using Doxotero Injection, inform your doctor about your current list of medications, over the counter products (e.g. vitamins, herbal supplements, etc. ), allergies, pre-existing diseases, and current health conditions (e.g. pregnancy, upcoming surgery, etc.). Some health conditions may make you more susceptible to the side-effects of the drug. Take as directed by your doctor or follow the direction printed on the product insert. Dosage is based on your condition. Tell your doctor if your condition persists or worsens. FOSapretero 150 mg Injection is used to prevent nausea and vomiting due to chemotherapy. 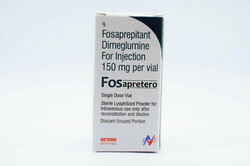 FOSapretero Injection contains Fosaprepitant as an active ingredient. Hetero Drugs manufactures FOSapretero Injection. Before using FOSapretero Injection, inform your doctor about your current list of medications, over the counter products (e.g. vitamins, herbal supplements, etc. ), allergies, pre-existing diseases, and current health conditions (e.g. pregnancy, upcoming surgery, etc.). Some health conditions may make you more susceptible to the side-effects of the drug. Take as directed by your doctor or follow the direction printed on the product insert. Dosage is based on your condition. Tell your doctor if your condition persists or worsens. Blaztere Injection is used for Hypercalcemia, Multiple myeloma, Bone metastases, Paget's disease, Osteoporosisand other conditions. Blaztere Injection may also be used for purposes not listed in this medication guide. 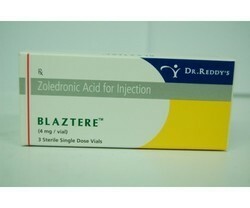 Blaztere Injection contains Zoledronic Acid as an active ingredient. Blaztere Injection works by lowering high blood calcium levels. Before using Blaztere Injection, inform your doctor about your current list of medications, over the counter products (e.g. vitamins, herbal supplements, etc. ), allergies, pre-existing diseases, and current health conditions (e.g. pregnancy, upcoming surgery, etc.). Some health conditions may make you more susceptible to the side-effects of the drug. Take as directed by your doctor or follow the direction printed on the product insert. Dosage is based on your condition. 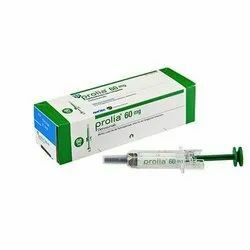 We are offering Prolia 60mg our cilints.